The BAS industry has seen vast improvements in the last 8 years. Protocol wars have ended during the last couple of years. Integration became an important factor. It seems that a majority of the buildings are web enabled. We have more tools to analyze data and we can communicate better with our buildings. What does the future hold for the building automation industry? Before finding out the answers, let’s learn about two new emerging technologies which will revolutionize the building automation industry. The first emerging technology is internet protocol version 6. IPv6 will change how the industry thinks about communication. Since the protocol wars have diminished and the wireless technologies are improving IPv6 will give us unlimited number of possibilities. What is internet protocol and why will IP version 6 become more important? Internet protocol is the set of techniques used by many hosts for transmitting data over the Internet. It is the backbone of our daily lives in building automation. The IPv4 that is in place has limitations and we are running out of IP addresses. IPv4 is 32bit and we have a little over 4 billion internet addresses. IPv6 is 128bit, which gives us 2128 possible I.P. addresses. (340,282,366,920,938,000,000,000,000,000,000,000,000). IPv6 means that every device that we have in our buildings can have an IP address. Every single point and component in the entire universe can have a unique IP address. Our networks will be able to assign more IP segments and devices will get an IPv6 assigned to them. This will be a revolution for our buildings because our programming methodologies will change drastically. With the implementation of IPv6, IP addresses will be more abundant. Every small device will have an IP assigned, such as Temperature sensors, VFD’s, actuators, Power monitoring devices, Starters, Humidifiers, etc. The actual benefit of IPv6 comes with the next emerging technology Cloud Programming. What is Cloud Programming and how will it help us? The main benefit of IPv6 will be seen with major implementations of Cloud computing. It has already been implemented by major corporations. Amazon uses cloud computing to scale their servers. Google uses cloud computing for their applications such as G-mail, Google Docs, etc. Cloud computing gives us the flexibility to expand our infrastructure and also makes it easier to compute very sophisticated algorithms. 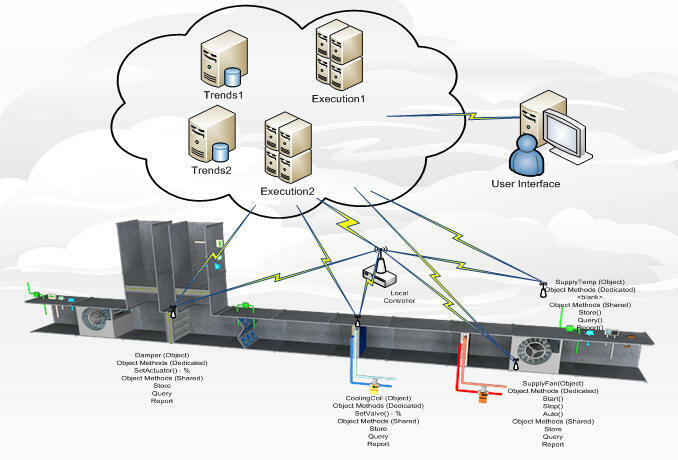 Cloud computing benefits will be seen when trend data becomes a part of the building automation programming. Cloud will be where the applications run and where the data is stored. We will be able to access the cloud with a web based and/or a desktop based application. As the amount of the data and the requirement for algorithms increase, a BAS cloud will be able to expand itself to accommodate the needs of our systems. BAS cloud applications will be familiar to object oriented practices and it will give programmers more opportunities, since each device will become an object with direct communication to the device via IPv6. Here is a scenario of an air handling unit controlled by the cloud. The air handling unit has a supply temperature and it has methods stored in the sensor. The sensor has a mini computer that is capable of simple calculations and able to communicate to the cloud or the local controller. The local controller consists of wireless connectivity devices and is located close to the specific air handling unit or units. It does not require input output cards as every device communicates via IPv6. The local controller is programmed to run the air handling unit optimally. It’s main purpose is the calculate PID loops, starts and stops, etc. The local controller’s application is automatically updated by the cloud. Every device on the network such as temperature sensors can connect to the cloud for simple executions such as storing trend data and also can initiate a query from the cloud and can return the value to the cloud, to the local device and to the local user interface. This will enable the programmer to have vast possibilities for their applications. The cloud can automatically calculate different variables such as power consumption changes from the cloud database and can generate reports for the whole life time of the building. That much data can be used to optimize the building to its fullest extents. The same programming syntax can be both used in the local controller and in the cloud. The code will be a lot easier to read since the programmer does not have to remember on which input or output device that sensor is installed on, he will simply use the IPV6 address. Complex algorithms can be calculated in the cloud and the values can be returned to the local device. Complex algorithms can be executed on the local device and can be calculated in the cloud. Sample code can be written in a way that the cloud can calculate any trend from the cloud and push the value to the local controller. Sample code executes the code on the Cloud and asks the execution result to be returned to the local device. Each manufacturer will have their own self check for their devices. When an error failure occurs, it will report it to the local device, to the cloud and to the web user interface directly. This will create a true event based programming which can be used to create more complex algorithms for building automation. Every device will be trended to the server which will give us the opportunity to play back their performance and see the peak hours just like we play our movies on our computers. Engineers will be able to find problematic areas easier and visually rather than finding points on charts. Once we have enough data stored, the cloud will be able to calculate predictions for the future and will alert the user for possible break downs. Once a device fails, our automation system responds to us with an email on failure. The cloud computing will be able to analyze the system with one month of data and it will update the code in the local device based on possible failure scenarios. After one month of data is written to the cloud, it will start running scenarios and the most optimal response code will be uploaded for execution. Failure scenarios and the optimal touches will be uploaded from the cloud to the local device. For example: an AHU has been running for a month and we have enough data. We will run a failure scenario code on the server for temperature sensor failure. The cloud will predict the outcome of 0-100 F on that given quarter. It will find the most optimum use for the quarter for the temperature sensor. Once the calculations are completed, scenario results will be uploaded and will be waiting for a failure to execute. Emergency scenarios such as chemical spills can also be simulated for a whole campus. More complex calculations can be calculated in the cloud and results can be uploaded to the all local devices from the cloud. Open source standards will be the key to this implementation. Key companies in the automation industry have to put their energy into creating systems as complicated as this. Technology companies can invest in open source standards for virtual cloud applications. Large software development and automation companies can create the standards of the next generation BMS systems. By making partially open source standards the automation community can fill the gap of real life automation problems. Alper is a systems and graphics designer specializing in Tridium integration. He has been working in the building automation industry for over 10 years. His expertise in graphics and Tridium programming is not easily matched. He started in Turkey working on computer hardware, modeling 3d graphics with Raydreams and drafting with AutoCAD. When he arrived in America he studied at Broward College and immediately integrated into the building automation market as a Systems Design Assistant. Today he runs his own business modeling graphics in Maya and developing Tridium AX based systems. He is considered a Tridium AX guru by those that know him and have worked with him. He has worked on systems reaching from Guam to New York and all over the United States in between.